People in both cities are active and burn over 430 calories a day. 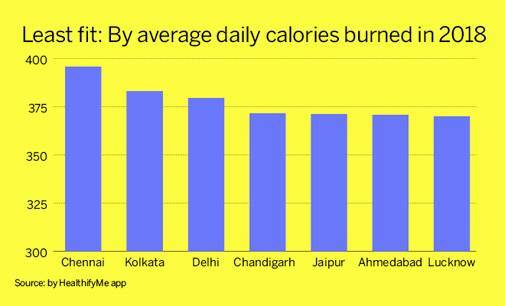 The data from app also reveals that almost 44 per cent of Indian men and 53 per cent of Indian women are 'inactive', burning less than 50 per cent of their calorie burn budget in a day. The study says only 34 per cent men are 'active', burning more than 80 per cent of their calorie burn budget while 22 per cent are 'mildly active', burning between 50-80 per cent of their calorie burn budget. When it comes to women, only 24 per cent are 'active' and 22 per cent 'mildly active'. Calorie budget is the number of calories that a person should burn through physical activity, daily. 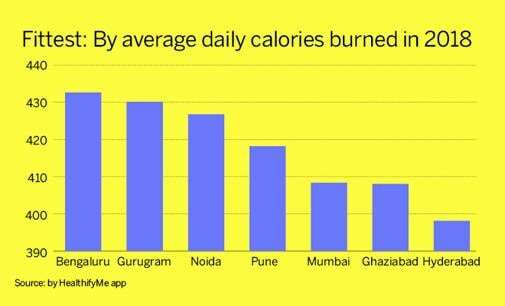 "The average calorie burn budget of Indian men is 476 calories per day vs. women's 374 calories per day, out of which men burn 55 per cent (262) while women burn just 44 per cent (165). 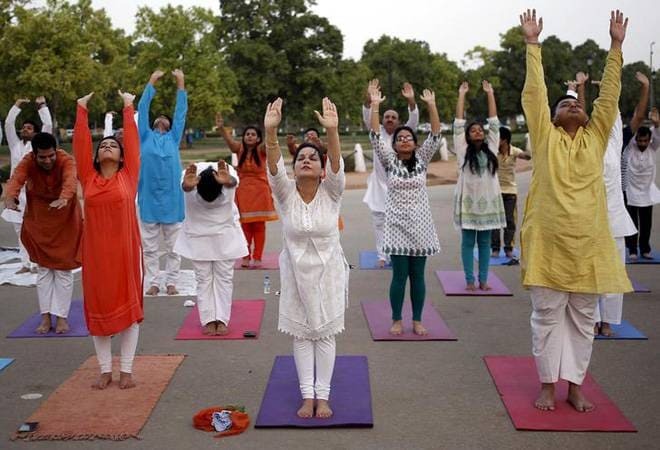 The silver lining is that Indians are improving their activity levels," the analysis says. "Compared to 2017, Indian men burn an average of 19 per cent more calories and walk 15 per cent more steps daily this year. Similarly, Indian women burn 19 per cent more calories and walk 13 per cent more daily, than last year," it added. According to the app, walking and running continue to be the exercises of choice across the length and breadth of the country. Other top activities include push-ups, rope skipping, yoga (particularly 'Surya Namaskar'), gym exercises like treadmill and cross trainer and home exercises like planks and abs crunch.